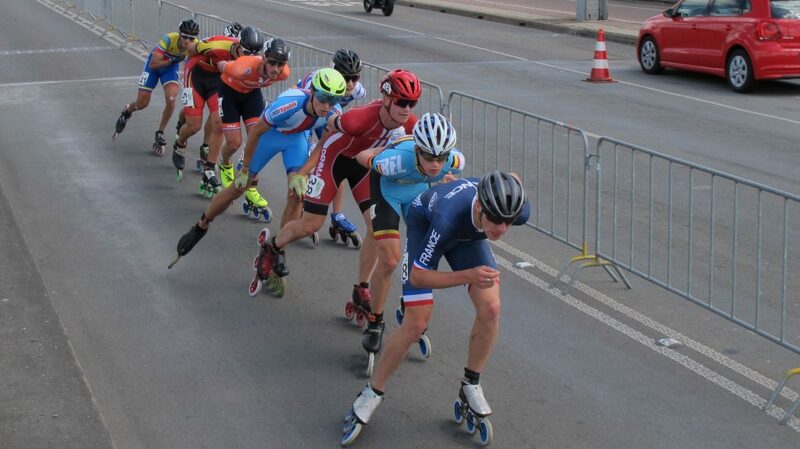 Tomas Bohumsky is racing as a junior this championship, but actually he’s only a youth. Surprisingly he was part of the break-away and finished in 12th place. After the race he’s standing together with his fans and coaches who are very surprised and proud as well. How was the race? Tomas: “It was so hard, because in a lot of places was a big wind. So it was hard to go in front, in cost a lot of energy. I wanted to stay in the group and save energy, because it was also so fast with the senior men, and many people. It was my first marathon ever, I never skate before the marathon. I only wanted to finish the marathon, that was my goal. Did you train for it? “No, I normally train on the street for the track competitions, but for the marathon I don’t know. Tomas will first fly to Majorca now for a well-earned vacation. We’ll see him again in Oostende where he will race in the youth category at the European Championships. Tomas with his teammates Katerina Kainova, Andrea Locvenkova and Jan Pribik. Andrea finished in the peloton in 50th place in the women’s marathon.